Get some bamboo leaves and straw ( or just get some cotton string) at your local chinese market or your local Hong Kong wet market. You will need to soak them overnight or in hot water for a couple of hours. Then be sure and cut off the hard tips at the base of the leaf. Keep the pliant bamboo leaves in cool water as you wrap the zong zi. Did I mention that bamboo leaves smell really good? Especially when they are cooking, they smell like you are having a heavenly banquet at your house. I love the smell of cooking bamboo leaves, there is nothing else so homey and fragrant. The glutinous rice also need to be presoaked. I've mentioned before how hilariously Hong Kong is attuned with certain commercially viable seasons (like the season for Steamed Hairy Crab) and the season for Zong Zi is certainly one of these. For the few weeks before Dragon Boat Festival, or 端午節, almost every local store we walked into, from the kitchen store to hardware store, has glutinous rice, mung beans and bamboo leaves for sale. It feels most jolly and festive and seasonal and we love it! Yes to regionalism and yes to carry on our beautiful wise historical knowledge and traditions! One of my early memories is of sitting in our bright yellow kitchen and helping my grandma shape her homemade red bean paste in readiness for placing into her red bean paste zong zi. I remember quite vividly thinking as a child that these delicious red bean paste shapes looked just like turds! (But delicious turds! Seriously, I thought of Red Bean Paste in my little child's head as 'Chinese chocolate'!) My grandma's red bean paste, or 紅豆沙, was and is the best red bean paste I've ever had and the major reason that Red Bean Paste Zong Zi was my childhood favorite food! And then there's the actual wrapping of the zong zi which is the thing that terrifies people from making zong zi. Which everyone ideally should make since it is so much better tasting than the stuff you buy or the things that you can order in restaurants. Both my grandma and my 老公's grandma made their own zong zi and sold it and had very thriving home businesses from doing it. (My 老公's grandma paid off a house mortgage by doing this! Yeah for awesome grandmas everywhere!) That should tell you much about the state of commercially purchased zong zi and just how much tastier homemade zong zi (made with love) are. 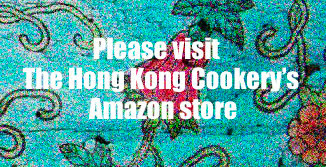 However do not fear, the Hong Kong Cookery is here! We have done our first ever video, showcasing just exactly how to wrap a zong zi! It's much easier once you get the hang of it. Hope you like our How to Wrap a Red Bean Paste Zong Zi video! Any questions please ask us. For more illustrative photos of the wrapping zong zi process, check out our post on making of savoury pork and mung bean and salted duck egg zong zi where we have many more photos of the zong zi wrapping. The next step after mastering the wrapping of the red bean paste zong zi is the long cooking of the zong zi. If you're asking why so long, let me just say that the glutinous rice requires a long, long cooking time to loosen and soften the rice to the appropriate level of softness and fluffiness. So, don't skimp on the cooking time! Trust me, you need to cook it for seemingly forever. But it's worth it! And then finally, at long last! Opening your lovely homemade zong zi and out comes a indescribably yummilicious puff of fragrant rice scent infused with bamboo leaf. Then you stick your chopsticks into that soft, fluffy, tenderly sweet and fragrant sweet red bean past zong zi for your first bite. So meltingly delicious! I hope that you enjoy my grandma's red bean paste zong zi as much as I do! Tip: If you prefer savory zong zi over sweet, check out our savory pork Zong Zi Recipe! Tip*: To make your own Red Bean Paste, see my Grandma's recipe for Red Bean Paste here. Update: Check out our latest, a step by step guide on How to Wrap Mini Zong Zi Rice Dumplings, half sized small zong zi that are the perfect tea time treat. Soak your bamboo leaves and straw ties over night in water. Or in hot water for 1-2 hours until soft and pliable without breakage. It is a good idea to prepare a few more than you need in case of breakage and splitting of the leaves and ties. Once pliable pour out soaking water and add fresh water. Cut off the hard tips at the base of the bamboo leaf. Keep soaked in cool water as you work. Rinse the rice and soak an hour in cool water. Pour out the water. Shape your red bean paste into 2.5" long and 3/4" wide rolls. (See photo above.) Cover and place in refrigerator to allow to firm up for 1/2 hour. With all the prepared ingredients at hand, take two bamboo leaves and put them side by side, overlapping by 1 1/2" to 2" or so (depends on your leaf size). It should feel structurally like one leaf and not two. Fold the base up by around 3" and then immediately fold in the right hand side of leaf structure by approx 2.5" to create a sturdy little pocket, holding it in place with your thumb. Holding this pocket together with one hand, use the other hand to scoop 3 tbsp rice into the pocket, spreading it out 3" from the base up, leaving a bit more at the bottom. Then you can carefully place your prepared red bean paste roll onto the rice about 3/4" up from the base. Then spoon over about 3-4 tbsp more of the glutinous rice, barely covering all the the red bean paste and allowing a bit more rice on the top. Be sure not the squeeze the zong zi at any time. Just hold firmly enough to keep everything in place. Wrap and tie up the zong zi as per the video instructions in our How the Wrap Red Bean Paste Zong Zi video. Put zong zi in pot that can comfortably fit them and cover with 2" of water. Boil over medium high heat for 4 hours. Be sure to have boiling water at hand in order to replenish the water as it cooks down. You can eat at once (yum, yum!) or you can let cool and store in the fridge for a week. If you are planning to eat them slowly, freeze them at once. To eat again, take out of fridge and boil in water for 12 minutes, or out of the freezer and boil for 25 minutes (no need to defrost, just stick in water and heat up). Enjoy your Red Bean Paste Zong Zi Love! Tip: If your bamboo leaf decides to split while you are wrapping your zong zi, don't despair! Just add a bamboo leaf over the one that has split and usually you can complete the zong zi without further problem. I wish my grandma & mother made these type of the "sweeter" version of zong zi. Besides a savory version, the sweeter version had some small red wooden stick that made the rice of the zong zi yellow and red around the stick. You would then eat the zong zi with some sugar. I am not sure why the rice is yellow though. Sadly I don't have any photos as they have now passed on. I suspect they added iodine to the zong zi rice, which made it turn yellow after it was cooked. The red stick came from a red 2 inch square wooden block, which we then cut into small toothpick sizes and insert into each zong zi. When it is cooked, the zong zi rice is yellow and the area around the stick is red. I wish they had made your version of with the red bean paste instead. I bet it tastes better than the ones I had eaten growing up. Now that I am older, it sort of became a lost "art" and find it much easier to buy them rather than take the time to make them from scratch. Jianshui zong (碱水粽): Meaning "alkaline water zong," these are typically eaten as a dessert item rather than as part of the main meal. The glutinous rice is treated with lye water (aqueous sodium hydroxide), or potassium carbonate, giving them their distinctive yellow color. Jianshui zong typically contain either no filling or are filled with a sweet mixture, such as sweet bean paste. Sometimes, a certain red wood sliver (shu mok) is inserted for color and flavor. They are often eaten with sugar or light syrup.